We work with many leading high street retail stores to offer vacuum metallising for point of sale and display unit components that are specifically designed to showcase products. These display units are often seasonal projects for retail promotions and sometimes an all year round assignment. Therefore customers require display units to be durable and easy to maintain. Point of sale units and components are pre-moulded before they arrive at Dual to be metallised for a chrome, gold, rose gold or pink gold finish. Before we take on a customer’s project we test and inspect their pre-moulded items to ensure they conform to our metallising and spray painting processes. A service we offer all our customers is the design and manufacture of customised jigs with tailored holding points. This is to ensure the surface area will be covered when metallising or spray painting. The first step is to securely fix the product onto a jig to avoid manual handling which may affect the finishing. The display unit is then sprayed with de-ionised air to remove dust and interfering static particles. The next step is to apply a pre-lacquer which we also refer to as the flow coat. The product is put into a machine for this process and if it’s of an unconventional size we spray the part with the pre-lacquer/flow coat. This protects the surface area and enables the component to withstand metallising or spray painting. Once dry, the part is put into a vacuum metallising chamber. This takes 15-20 minutes and gives the display unit a chrome effect finish which later helps with the intensity of the required colour. When dried, a top lacquer is applied which acts as a shield before the product is dip dyed. The final part of the process is dip dying to get the accurate shade. We offer a range of shades and finishes dependant on customer demand. Various types of lacquer are available to provide protection so that the display unit or point of sale component can be utilised in many environments and display a range of products. 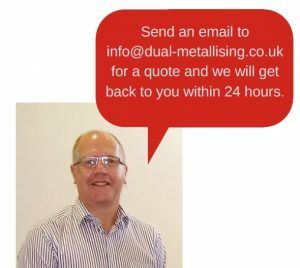 Dual’s hardworking and extremely talented team can complete your project within four working days from quote acceptance. The last 24 hours are required to allow enough time for the layers to cu properly before the product is packaged for delivery.